Melvyn Bragg had done his homework. He is terrifying, yes, but he certainly knows his parchment from his paper, his saga from his settler and his author from his oral tradition. I am of course talking about BBC 4’s In Our Time with Melvyn Bragg, recently featuring (*get ready to Old Norse geek-out*) the juicy topic: ‘Icelandic Sagas’. Forty-five minutes of saga talk? What bliss, what joy, what music to the medieval-minded ears, I hear you cry! …Well, go to the BBC’s website and listen to it then: http://www.bbc.co.uk/programmes/b01s8qx9. Be warned, you may have to make several cups of tea, gorge yourself on countless biscuits and start manically flicking through your dog-eared version of Laxdæla Saga trying to work JUST WHO DID GUÐRÚN REALLY LOVE MOST whilst listening to this interesting discussion, rooted in a world of heroes and outlaws, blood-feuds and love-triangles, personal politics and society in 13th-century Iceland. But how on earth did dear old Mel know such mind-blowing facts? Well, apart from his own careful research (impressive, given that most presenters usually lump ‘sagas’ together with popular images of monk-bashing vikings), he was helped by the three musketeers of saga scholarship: Dr. Carolyne Larrington (University of Oxford), Dr. Elizabeth Ashman Rowe (University of Cambridge) and Dr. Emily Lethbridge (Árni Magnússon Manuscripts Institute, Reykjavík). Between them, the speakers take the listening audience on a brief tour around the vibrant, creative literary landscape of 13th- and 14th-century Iceland, remarking on some of the impulses and ideas behind the famous Íslendingasögur (Sagas of Icelanders). 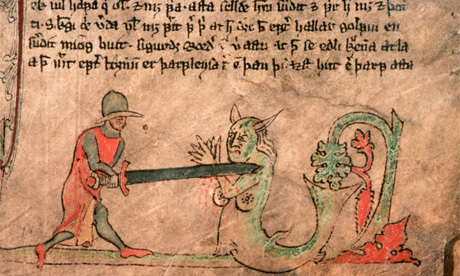 A 13th-century illuminated Icelandic Saga manuscript, nabbed from the Guardian’s website (of all places) which informs me the photograph was taken by Bob Krist/Corbis. So there you are. After a short, sharp introduction courtesy of Mr. Bragg, the panel begin with a brief overview of early Icelandic history. Delving a little deeper, Carolyne Larrington and Elizabeth Ashman Rowe consider Iceland’s move to a more literary culture* following the country’s conversion to Christianity c.999/1000 AD. The coming of Christianity of course brought a crucial new technology – writing – allowing Icelanders, for the first time ever, to take their fluid oral tradition and write it down, fixing their stories and poems via pen to parchment. Emily Lethbridge expands on Carolyne and Elizbeth’s observations with a discussion of the (often fragmentary) manuscripts in which the sagas are preserved. Emily’s comments lead on nicely to a general discussion between the three academics about the sagas themselves; the unruly chieftain Hrafnkel and his holier-than-thou horse, Freyfaxi, are mentioned, as is the famous love-fuelled feud between Guðrún, Bolli and Kjartan in Laxdæla Saga. Zombies, cheese-theft and prophetic dreams all get a mention, leaving me feeling rather alarmed at my general preference for eddic and skaldic verse over sagas (first world problems an’ all). After all, the impression I get whilst chomping away on my hob-knobs is that SAGAS ARE RIDICULOUSLY AWESOME. Of course, it would have been nice to discuss the gods and giants of eddic poems, but this would have taken a rather wide detour and parked about 70 miles away from a discussion solely focused on the ‘sagas’. Perhaps another time – In Our Time: Icelandic Stuff Inc. Awesome Poems Part II? I for one would like to see dear Braggers navigate his way through the riddling intricacies of cryptic, skaldic verse (I bet he could, as well). But alas, I digress. In Our Time: Icelandic Sagas is a discussion about sagas, and it is by all means a truly interesting one. Furthermore, it is exactly what scholarship should be about – converting niche and narrow (but nonetheless important), highly specialised areas of research into bite-size chunks for general public consumption. Between them, Carolyne Larrington, Elizabeth Ashman Rowe and Emily Lethbridge get the tone just right. The discussion is not pitched at too high-brow a level (no discussions on Carolingian minuscule and Gothic hybrid, thank heavens), yet it is not dumbed down either: all three academics retain proper Icelandic pronunciation of names and places, whilst ensuring that important details (such as the Celtic injection into Icelandic settlement and the Christian influence framing the written texts) are not skipped over. So, whether you are currently writing your thesis on vowel shifts present in the orthography of Old Icelandic legal texts, or you thought that Iceland was a place you could buy frozen samosa’s with Kerry Katona grinning manically at you from behind the check-out, this short 45 minute discussion really is worth a listen. It is academia in action, bringing the world of saga heroes and their adventures across the radio-waves and into the living rooms of marginally less rugged, feud-obsessed people of today. As our dear old saga author himself might say: ‘that was well done’. * Of course, oral traditions in Iceland didn’t stop when pen was put to paper. Instead, Iceland enjoyed an oral-literary continuum long after the introduction of writing, as is proven by the many interesting manuscripts variation (yes, ‘variations’, NOT ‘errors’ – screw you, A. E. Houseman). This entry was posted in Books, History, Norse, Pop Culture, Uncategorized. Bookmark the permalink. To be fair, Melvyn is a deeply cultured man who has written historical novels set in the early middle ages, and a history of the English language. I suspect he knows more about sagas than most.